Yes, Ralph Northam should go. But where were the calls for Sen. Cindy Hyde-Smith to resign? Most Republicans and Democrats seem to agree on one thing: Democratic Virginia Gov. Ralph Northam should resign because he may have posed in 1984 for a photograph, wearing either blackface or traditional KKK garb. Yet outraged calls for resignation from prominent figures were hard to find in the case of Sen. Cindy Hyde-Smith, a Mississippi Republican. As an appointed U.S. senator campaigning for her own term last fall, in a state infamous for its history of lynchings, she joked about "public hangings" before a group of white supporters. A few days later, a photograph surfaced of Smith wearing a Confederate military hat and holding a rifle at the Jefferson Davis home in Biloxi. Hyde-Smith had posted the photograph on her Facebook page in 2014 and exclaimed in a caption, "This is a must see. Currently on display are artifacts connected to the daily life of the Confederate Soldier including weapons. Mississippi history at its best!" Arguably, Northam's blackface escapade from 35 years ago is less outrageous than a senator joyfully endorsing the use of deadly weapons to defend owning black people just a few years ago, when she was a statewide official in her mid-50s. But there was no groundswell of elected officials - national or state, Democratic or Republican - demanding that Hyde-Smith step down. Mississippi Gov. 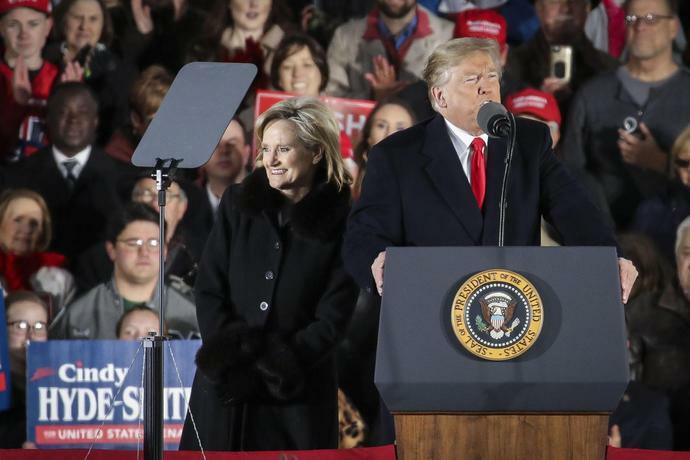 Phil Bryant named Hyde-Smith to the Senate seat after Sen. Thad Cochran resigned in April 2018. She campaigned for a two-year term against Democrat Mike Espy and won by 8 points. Espy in 1986 became the first African-American since Reconstruction to represent Mississippi in the House. He later served as Agriculture secretary for President Bill Clinton. He might have been his state's first black senator since the 19th century. My home state of Mississippi is 50th in most everything the federal government measures but it ranks first in one thing: the number of lynchings of black Americans. It's 50th in health care quality and infant mortality rate, 49th in obesity rate and 48th in college readiness. But when it came to hanging blacks and mostly getting away with it, Mississippi was second to none. My state conducted mob executions of 581 blacks from 1882 to 1968, the most of any state. You can find the names of all 581 stamped on large, heavy steel plates hanging from on high at the National Memorial for Peace and Justice in Montgomery, Alabama. It's a frightening sight. If Hyde-Smith hasn't seen it, she should. The same goes for Northam. Virginia counts 83 blacks murdered by mobs - often with the acquiescence of the Commonwealth. It might help shake his rather hazy memories. First, Northam admitted he was in the photograph and apologized, but then a day later stated he was not in the photo. But then, he said he did blacken his face with shoe polish to mimic Michael Jackson doing the moonwalk. He was in his mid-20s at that time, and as hard as it is to imagine he "forgot," there's no doubt Hyde-Smith knew exactly what she was doing - only a few months ago with that hanging comment and a few years ago with those Confederate weapons. After Hyde-Smith won her runoff against Espy, Republican consultant and CNN political analyst Alice Stewart wrote, "While the race was closer than it should have been, there are no moral victories in politics - a win is a win." Yes, a win is a win. But racism is racism. And a Senate race won or a governor's seat desperately held onto, in the face of the ugliest strain of American racism, is an immoral victory. This article originally appeared on USA TODAY: Yes, Ralph Northam should go. But where were the calls for Sen. Cindy Hyde-Smith to resign?